My husband threw a bunch of seeds around his little alcove where his barbecue sits because he loves Morning Glories. Not only for the beauty, but because they are colorful and green all-summer-long. And, they cover the telephone poles in our small backyard. Yes, I said “poles”- plural. We have been blessed with two of them. I think the phone company ought to pay rent. And yes, we still have an old school phone line, not just a mobile phone. 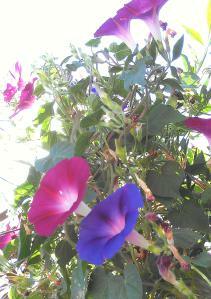 As I was sitting in my happy place—on my swing in our yard early one morning, I looked over at the now, climbing-everywhere Morning Glories. I thought to myself, how awesome are they? They are reaching towards the sun in the morning in all their glory. Just as we should be—reaching our hands toward the Glory of God as we awaken, to start the day in His presence. He will show us His abundant beauty all around us. And I thanked Him. The flower appears to have many visitors. The hummingbirds hover around them, but not as long as the huge bumble bees lately. As I sit and watch nature doing what nature does, I am in awe of what God has made. I am amazed by all the birds he created. From my very favorite Hummingbirds, (we now call Hummer Hogs since they eat so much) to Finch to the huge Canadian Geese flying over at the same time each morning. And, let’s not forget the butterflies. His Glory and we get to appreciate His creations. Each and every day, all around us. Do you see them? You know the old saying, “Beauty is in the eye of the beholder?” I believe it is. But one must behold. Stop, for just a moment in the busyness of your morning, afternoon or evening and look around you. God has given us much if we would take the time to discover what is just outside our door. Put your cell phone or tablet down. Shut off the television and computer. Take a step outside, breathe deeply and appreciate the glory of God. And then, smile and say, “Thank you Lord, for your creations.” I just know doing this would be a peaceful start to or end of your day. Ryan, so true! His beauty is all around us. We simply need to take the time and see it. Thank you. And thank you for visiting me here. Karen, I hope your blooms will flourish this year. Thank you for visiting me here. God Bless you. I love starting my morning by reaching out to God and letting him refresh me with His word. It’s glorious, like the gorgeous blooms in your yard! Beth, It is a glorious way to start the day, seeing God’s special “hello’s.” Thank so for stopping in. God Bless your day. Great message, Chrissy. I forget to do this because I am not an outdoor type person. Bonnie, sometimes you don’t even need to go outdoors to see the beauty God has around us. I sometimes peek through my window. 🙂 God’s blessings!